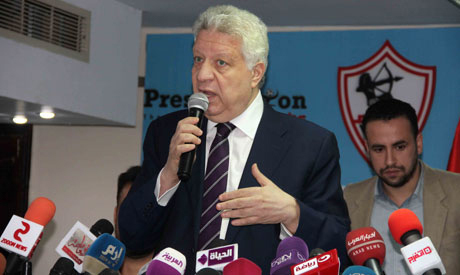 After beating Talae El-Geish 3-0 in the Egyptian Premier League on Thursday, Zamalek chairman Mortada Mansour has praised the performance of his team's players during the game, as well as management for signing the top players in Egypt. "We have the best players in Egypt, now we perform well as the substitute players are of a high level," Mansour told a television programme after the game. "We have talented players on the bench like Ayman Hefni, Kahraba, Abdallah Gomaa, Antar and Madboul, who can play better than the players in the starting lineup,"
"It's the management's task to sign talented players to ease the mission of the team's coach to make use of them," the Zamalek president said. Defender Mahmoud Alaa hit a hat- trick as Zamalek climbed to the Egyptian league summit after the defeat of Talae El-Geish at Petro Sports stadium on Thursday. The towering defender opened the score for the White Knights at the 32 minutes into the game with a nice header. He went on to add a second goal with the same style, three minutes from the one hour mark. He took the final goal at nine minutes from end of time, taking his tally to five goals in the Egyptian League so far. Zamalek are leading the league table with 13 points, one point ahead of second-placed Pyramids. Meanwhile arch rivals and title holders Ahly are fourth with 11 points, with one game in hands due to their participation in the CAF Champions League.